Bob Pickart was a college junior and summer student fellow with the Woods Hole Oceanographic Institution in Massachusetts when he embarked on his first oceanographic research cruise through the South Atlantic. As a math and physics major, Bob appreciated the opportunity to apply his scientific background to the real world. “I knew after the end of that thirty days that this was for me,” he remembers. Bob is now a Senior Scientist at Woods Hole. As a physical oceanographer, he studies ocean circulation and dynamics: where, how, and why water masses move. 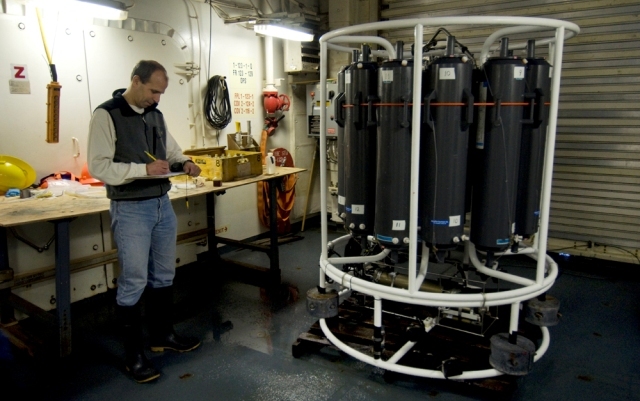 Since he’s an expert in high latitudes where storms and winds prevail, Bob’s role in ICESCAPE is to provide the science party members, many of them biological oceanographers, with knowledge about the physical characteristics of their water samples so they can better understand trends they discover in phytoplankton distribution, nutrient levels, and carbon dioxide concentration. 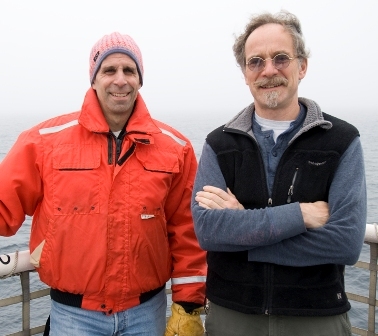 Bob and his right-hand-man, Frank Bahr, create property and circulation plots using information from the CTD — an instrument that measures conductivity, temperature, and depth of seawater — coupled with data from the Acoustic Doppler Current Profiler (ADCP). “I wouldn’t have sailed without Frank!” Bob exclaims, because Frank is a guru at analyzing data from the ADCP, which emits sound that reflects off bugs in the ocean to detect the direction and speed at which the water moves. “I like playing with data,” says Frank, who grew up sailing at his local yacht club in Germany. Sometimes the duo can produce their plots as quickly as ten minutes after the data are collected! Known for his endearing excitement in the Future Lab whenever the Healy approaches a spot of particular interest, one of Bob’s passions is a current that runs along the edge of the continental shelf called the “shelf-break jet.” In the Western Arctic, Pacific Ocean water from the Bering Strait forms this current at the boundary between the shallow Chukchi Shelf and deep Canada Basin. It’s so narrow and difficult to find that Bob and his colleagues didn’t completely verify its existence until eight years ago. Bob studies two different processes, winds and eddies, that affect the shelf-break jet and thus impact the biology within the water. Storms blow winds from either the east or west that result in wind-driven exchange of water and properties. But when the wind isn’t blowing, the current along the edge of the shelf becomes unstable and forms large meanders. These can often pinch off to form “eddies” (big swirls of water) that then move into the deep ocean. “I think the formation of eddies and their subsequent migration into the open Arctic is a major factor in setting the interior properties which impacts the ecosystem of the central Arctic,” Bob hypothesizes. He wants to know more, and hopes to find and survey an eddy in order to sample its physical, biological, and chemical properties very carefully. Studying just one would yield fundamental information that Bob could then extrapolate to consider the impact of one or two hundred eddies per year in the Western Arctic.